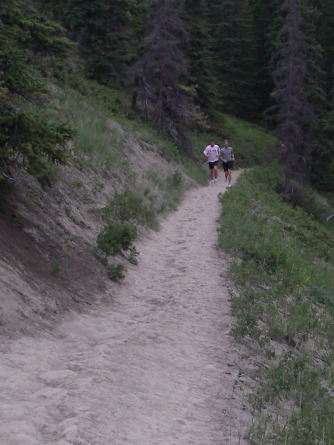 Fit-Ink: Trail Running: How Do They Do It? Trail Running: How Do They Do It? Give me a trailhead and I'll hike it. Give me singletrack and I'll mountain bike it (or try considering I hop off my bike at every scary turn, descent and tree root). But there's no way you'd find me running that trail with my running shoes--I could only dream of being coordinated, skilled, and any other adjective I can name that a true trail runner embodies. I know plenty of people who trail run, one friend who even swears by the Palos trails just outside Chicago's city limits for her return to running after repeated injuries. The problem: I'm just not one of them. I can only watch in awe. I barely get along with the pavement (you should see the scars on my knees and elbows, results of running falls). But me and the trails, I'm lucky I can walk or mountain bike them. I can barely survive a hike without tripping over a tree root or turning my ankle on a rock. As for running, I'm scared to even try--unless it was Palos' tamed crushed gravel trail, far away from the singletrack and a far cry from the trails I've hiked ever so slowly especially on the descents. That's where the above picture comes in. How do these guys run--yes, they were running when I spotted them on the trail in Jasper National Park way up north in the Canadian Rockies--the trails? And how do they run a trail as bumpy as this one so effortlessly? I just don't get it. I almost twisted my ankle on a misstep and could feel each tarsal of my foot on the rock-hard ground. Sand runs: Those make sense. Trails where you're negotiating rocks, tree roots, uneven surfaces: I'm clueless. Help a girl out. Trail runners: Can you offer an explanation?